Whilst the (un)holy triumvirate of Deep Purple, Led Zeppelin and Black Sabbath are often cited as the founding fathers of the Hard Rock/Heavy Metal dynasty we see today, there are a couple more names that were just as important in its genesis. The first is the mighty Judas Priest, their blistering twin guitar attack changing the Metal landscape forever, the other is Uriah Heep. Formed in London at the tail end of the sixties, their muscular blend of guitars and keys has endured pretty much without a break for nigh on fifty years now; it's an amazing feat virtually unmatched by anyone anywhere, regardless of their musical affiliations. In the early days, their studio output was absolutely prodigious (two albums a year wasn't uncommon), and although that has tailed off dramatically in recent years, the arrival of a new 'eep opus is still just as big a deal as England reaching the World Cup semi-finals! Following up the rousing 'Outsider' release from 2014, 'Living The Dream' is something of a milestone as it is their twenty-fifth studio album (if you include the re-recorded 'Celebration' effort from 2009). 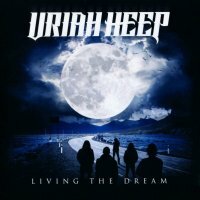 Long-time Heep fans will know that their signature sound is dominated by chunky power chords and swirling Hammond style keys (it is Heep rather than Purple who really pioneered this particular combination), and it is that intoxicating elixir that once again drives the band on 'Living The Dream'. Drafting in Canadian producer Jay Ruston (The Winery Dogs, Europe, etc.) to give their sound a slightly fresher feel (all the while retaining those classic Heep-isms), they've managed to create a sound that should reach out across generations. Jumping right in then, the brooding epic 'Rocks In The Road' is a classic example; the moody, extended guitar/keyboard interplay at the end echoing seventies Heep in their prime, whilst the verse and chorus deliver the perfect balance of hooks as well as angst. There is also the breathy, slow-burning, at times almost Folk-like 'Waters Flowin'' (very 'Led Zeppelin III'), the dynamic ebb and flow of 'It's All Been Said', the urgent 'Take Away My Soul' and the anthemic title track, all of which drip with melody and that oh so familiar sound. A veritable institution, Uriah Heep continue to buck the trends to deliver another classic in a way only they can – see you on tour guys!